TORONTO, ONTARIO–(Marketwired – June 24, 2015) –Continental Gold Inc. (TSX:CNL)(OTCQX:CGOOF) (“Continental” or the “Company”) is pleased to announce an updated mineral resource estimate for the Yaraguá and Veta Sur vein systems at its 100%-owned Buriticá project in Antioquia, Colombia. Undertaken by independent consultants, Mining Associates Limited (“MA”), the mineral resource estimate is based on 271,003 metres of drill core sampling and 7,215 metres of underground sampling (as at May 11, 2015) and was prepared in accordance with National Instrument 43-101 (“NI 43-101”). Notes – Reported tonnage and grade figures have been rounded from raw estimates to reflect the order of accuracy of the estimate. Minor variations may occur during the addition of rounded numbers. There have been no assumptions made as to metal prices or recoveries in this mineral resource estimate other than in gold equivalents that are calculated for AuEq = Au+ Ag/60. M in Figures and Tables represents millions. The mineral resource estimate represents significant increases in Measured and Indicated (“M&I”) resources and Inferred resources of gold, silver and zinc over those of the previous mineral resource estimate for the Buriticá project announced by the Company on May 13, 2014 which was based on the Buriticá database as at December 31, 2013 (the “2014 Estimate”). The updated mineral resource estimate reflects higher estimated tonnages and higher grades. Gold equivalent mineral resources in the M&I category increased by 60% at higher grades (11.4 g/t AuEq) than the 2014 Estimate (11.0 g/t AuEq=Au+Ag/50), reflecting the Company’s emphasis on infill drilling and sampling in 2014 and 2015. Inferred gold equivalent resources grew by approximately 9%, also at higher grades (9.0 g/t AuEq) than the 2014 Estimate (8.2g/t AuEq=Au+Ag/50), reflecting growth in both deposits through step-out drilling. The 51% increase in the number of composites defining the vein domains increased confidence in mineral resource estimations and demonstrate the continuity of the vein domains. Tonnage-grade estimates were also made of 2-metre wide halos on both sides of vein domains. These estimates were utilized to dilute vein domains to 1-metre horizontal width and will be very important for evaluating potential mining dilution in future economic studies undertaken by the Company. 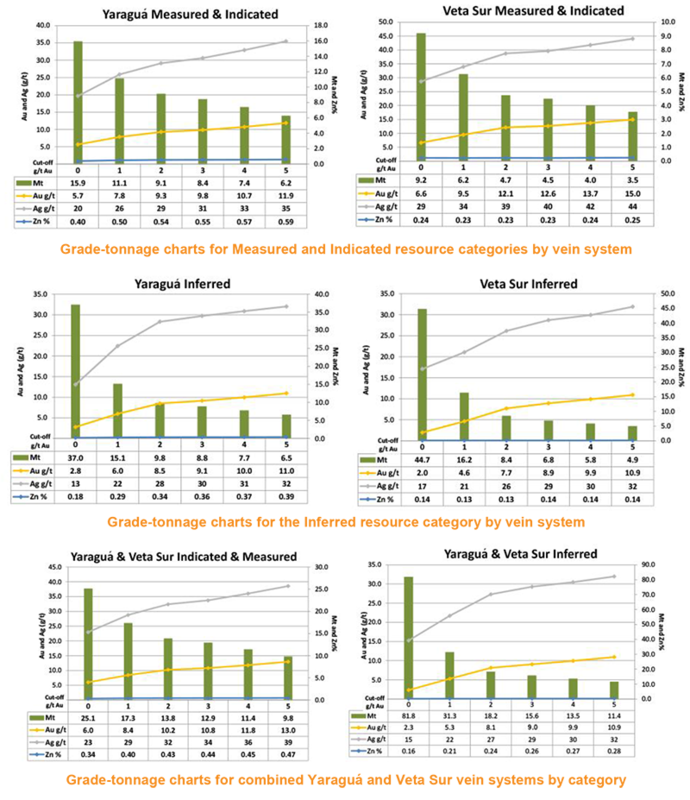 Grade-Tonnage charts (Figure 4) demonstrate the high-grade nature of the Yaraguá and Veta Sur mineral resources over a range of cut-off grades from 0 to 5 g/t gold. Estimates of tonnage-grade per vertical-metre (Figures 5 and 6) for the major vein domains demonstrate significant mineral resources over an elevation range of more than 1,000 metres, with less variation than the 2014 Estimate due to the marked increase in infill drilling. 80% of combined Yaraguá and Veta Sur gold resources are situated above an elevation of 1,000 metres, including 97% of combined M&I gold resources. Potential remains for future mineral resource increases in the Yaraguá and Veta Sur vein systems, as most of the vein domains modeled in each deposit are open at depth and to the west. The current mineral resource estimate also excludes a number of veins to the south and north for which there was limited drilling as of the database cut-off date. Continental’s 100%-owned, 59,283-hectare project, Buriticá, contains several known areas of high-grade gold and silver mineralization, of base metal carbonate-style (“Stage I”) variably overprinted by texturally and chemically distinctive high-grade (“Stage II”) mineralization. The two most extensively explored of these areas (the Yaraguá and Veta Sur systems) are central to this land package. The Yaraguá system has been drill-outlined along 1,100 metres of strike and 1,700 vertical metres and partially sampled in underground developments. The Veta Sur system has been drill-outlined along 1,000+ metres of strike and 1,800 vertical metres and has been partially sampled in underground developments. Both systems are characterized by multiple, steeply-dipping veins and broader, more disseminated mineralization and both remain open at depth and along strike, at high grades. This press release outlines updated mineral resource estimates for the Yaraguá and Veta Sur systems, superseding the 2014 Estimate. MA was commissioned to undertake mineral resource estimations for Yaraguá and Veta Sur. Andrew J. Vigar (B.Sc., FAusIMM, MAIG, MSEG and MA Director) has been responsible for estimations, which will be detailed in a Technical Report prepared in accordance with NI 43-101 to be filed on SEDAR within 45 days of this press release. There was close collaboration between MA and the Buriticá site geologists and consultants undertaken during site visits and at MA’s Brisbane offices, in particular on the selection and tagging of the vein domains in the context of available underground and surface geology. 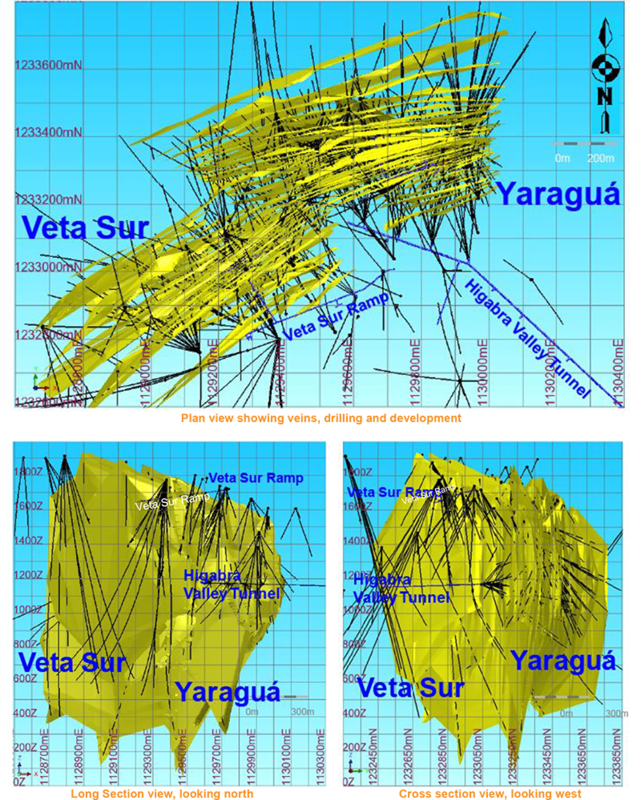 In view of their geology, grade distributions and potential mining methods, Yaraguá and Veta Sur were modeled as sets of sub-parallel, steeply-dipping vein domains (Figure 1) interpreted from geological mapping and sampling of underground developments and drilling in the upper part of the system and extended to greater depth and along strike from drill intercepts. Sub-grade areas where the interpreted vein domain passed through the drill-hole but was not already coded (i.e. “brought through”). Vein domains were modeled by MA running on the industry leading software Geovia Surpac. For Veta Sur (38 vein domains) and for Yaraguá (51 vein domains), assay intercepts were tagged by vein domain name and numerous iterations of 3D sections, plans and visualizations were done to ensure geometrically-consistent vein domains. Other mineralization is present outside of these domains and was partly included in halos around vein domains. Informing samples consisted of vein composites within domains and one composite sample across each vein intercept. The estimation grid size was 8 metres in X and Y with vein thicknesses (horizontal widths) and gold, silver and zinc grades estimated in 2D unfolded space using Ordinary Krige (“OK”) estimation of their width. The informing sample grades were capped on a vein domain or sub-domain basis as determined by geostatistical analysis. However, where blocks are within 25 metres of a capped value, a hybrid estimate was used – being a combination of the capped and uncapped estimate weighted by a binary indicator. A maximum of eight informing samples are used to estimate a block. Within the tightly-constrained vein domains, high-grade and low-grade sub-domains were outlined, using a 2-metre*grams gold boundary with at least three samples within that boundary. Results of the Krige estimation were validated against raw data statistics. Trend analysis was made against the informing samples and check estimates done using Inverse Distance Squared (IDS) and Nearest Neighbour (NN) (Polygonal) estimation techniques. The results (Figure 2) are generally in good agreement with the Krige estimates and grade patterns, highlighting the importance of the sub-domaining in minimizing grade “smearing” where data density was low. As expected, IDS estimates slightly higher grades and lower tonnes than OK, whereas NN estimates higher grades and lower tonnes. The halo zone on each side of the vein for up to 2 metres in distance was also estimated along with the vein in 2D unfolded space. Informing samples were selected separately for the hanging wall and footwall for each vein. Estimation parameters were the same as for that vein. For the dilution to a minimum width of 1 metre, the halo material was selected from the better grade side. The remainder of the halo was unfolded and included in the 3D model to allow for estimation of mining design and dilution. Some minor additional areas with at least one informing sample within 150 metres are included at depth where geological continuity is good but drilling is sparse. Figure 3 shows an example of a vein domain for which mineral resources have been estimated by OK of sub-domains. Areas within a vein domain already taken by development and/or historical mining have been removed and also screened for topography. Volumetric estimates were converted to tonnage estimates utilizing an average specific gravity of 3.1 for veins and 2.84 for halo dilution, based on core measurements and computed from multi-element assay data. Grade-Tonnage charts for 0 to 5 g/t gold cut-off grades are presented below (Figure 4) by mineral resource category for both the Yaraguá and Veta Sur vein systems. These are the capped OK estimates for vein domains, diluted to one-metre minimum horizontal widths. These results demonstrate the high-grade nature of the Yaraguá and Veta Sur vein systems over a broad range of gold cut-off grades. The mineral resource tonnes tabled in Figure 4 are only within the tightly-constrained vein domains and thus do not reflect large quantities of undefined lower-grade (less than 3 g/t Au) material outside the currently-defined vein domains. The results presented below (Tables 1, 2 and 3) are capped Krige estimates at 3 g/t gold cut-off grade and for one-metre minimum horizontal vein thicknesses. This gold cut-off grade reflects conceptual costs for underground development, mining and treatment. These mineral resource estimates for the Veta Sur vein system are contained in 38 vein domains with average strike extents of 575 metres and average depths extents of 990 metres (Figure 1) within more extensive vein envelopes, up to 1,140-metre strike length and 1,600-metre vertical extents. As well as significant vein extensions to the southwest and to depth, additional vein domains were outlined to the north of the 2014 mineral resource envelope. Most of the modeled veins are open at depth and along strike to the southwest. Vein domains average 1.1 metres (diluted) horizontal width. The current mineral resource estimates for Veta Sur represents a significant increase in both tonnage and grades compared to the 2014 Estimate. M&I increased by 65% and M&I grades are higher than the 2014 Estimate (12.6 g/t gold and 13.3 g/t AuEq versus 10.9 g/t gold and 11.6 g/t AuEq=Au+Ag/50), largely reflecting successful infill drilling. The tonnage of Measured resources is slightly higher but the Measured grades and contained ounces are lower in the current estimate relative to the 2014 Estimate, largely due to depletion at very high grades of material mined in Veta Sur development. Inferred Resources in Veta Sur are up 96% and Inferred grades are higher than the 2014 Estimate (8.9 g/t gold and 9.4 g/t AuEq versus 6.6 g/t gold and 7.1 g/t AuEq=Au+Ag/50), reflecting successful step-out drilling. Even though the Veta Sur vein system has significantly grown in all mineral resource categories, there are areas where sparse drilling did not satisfy the minimum criteria for Inferred Resources, leaving potential upside growth in the future. Mineral resource growth and the increased proportion of higher confidence (M&I) resources reflect a 73% increase in the number of composites defining the vein domains in Veta Sur, primarily resulting from 2014-2015 drilling. A chart of tonnage and gold grade (calculated at 50 vertical-metre intervals) versus elevation (1,500-metre range) for the bulk of the Veta Sur mineral resource (above 3 g/t gold cut-off) is presented below (Figure 5). The highest grade resources are currently between elevations of 1,600 to 1,800 metres. Otherwise, the Veta Sur system demonstrates remarkably consistent gold grades over more than 1,000 metres of vertical extent. Tonnages for level slices decrease at higher elevations, due to the intersection of certain veins with the topographic surface and also limited by drilling at shallow depths. Lower tonnages at lower elevations are a reflection of limited deep-drilling conducted to date by the Company. However, gold grades continue to be high (averaging 9 g/t gold) in these areas and may suggest the potential of depth at Veta Sur. 76% of Veta Sur gold resources, including 98% M&I mineral resources, are located above elevation of 1,000-metres, yet there may be scope for increasing the confidence levels of resources at all elevations drilled to date. These mineral resource estimates for the Yaraguá vein system are contained in 51 vein domains containing mineral resources above 3 g/t gold cut-off grade with average strike extents of 470 metres and average depth extents of 910 metres (Figure 1) within more extensive vein envelopes, up to 1,125 metres strike length and 1,540 metre vertical extents. As well as vein extensions, additional vein domains were outlined to the north and south of the 2014 Estimate and additional veins were added in central and eastern Yaraguá. Most of the modeled veins are open to depth and along strike to the west. Vein domains average 1.1 metres (diluted) horizontal width. M&I increased by 57% and M&I grades are comparable with the 2014 Estimate (9.8 g/t gold and 10.3 g/t AuEq versus 10.0 g/t gold and 10.6 g/t AuEq=Au+Ag/50), largely reflecting successful infill drilling. Gold and gold equivalent grades of Measured resources are slightly higher but tonnages were down in this category due largely to current and historical mining depletion in 2015 relative to 2014 estimates. Although Inferred Resources in Yaraguá decreased by 18% versus the 2014 Estimate, the grades are higher (9.1 g/t gold and 9.6 g/t AuEq versus 6.6 g/t gold and 7.1 g/t AuEq=Au+Ag/50). The decline in Inferred resources reflected successful conversion to Indicated resources, largely from infill drilling results. Step-out drilling results were largely responsible for the increased grades of Inferred mineral resources in the current estimate. Although the Yaraguá system was extended in 2014-2015, some areas of sparse drilling did not satisfy the criteria for inclusion to Inferred resources, leaving potential growth upside for future drill testing. Mineral resource growth and the increased proportion of higher confidence (M&I) resources reflect a 44% increase in the number of composites defining the vein domains in Yaraguá, primarily resulting from 2014-2015 drilling and channel sampling. A chart of tonnage and gold grade (calculated at 50-metre vertical intervals) versus elevation (1,500-metre range) for the Yaraguá mineral resource (above 3 g/t gold cut-off) is presented below (Figure 6), and illustrates the character of the mineral resources at Yaraguá over a 1,000-metre vertical range. Level slice tonnages decrease above elevations of 1,300 metres due to a lack of shallow drilling and due to various veins intersecting with the topographic surface. Tonnages decreased below elevations of 1,200 metres due to sparser drilling-data, resulting in limited modeling of the vein domains at depth. Gold grades otherwise show limited variation over a 1200-metre elevation range, but are highest at the lowest elevations drilled to date. 83% of Yaraguá gold resources, including 97% of M&I resources, are above elevation of 1,000 metres, yet there may be scope for increasing the confidence levels of mineral resources over all elevations drilled to date. The 2015 mineral resource estimate represents significant increases in M&I resources and Inferred resources of gold, silver and zinc compared to the 2014 Estimate, reflecting higher estimated tonnages and increased grades (Figure 6). Figure 7 illustrates the substantial growth in Buriticá gold resources from 2011 (the first mineral resource estimate) to the current estimate. This growth has been coupled with significant increases in M&I (essentially Indicated) resources and also increased proportions of this higher confidence mineral resource category. Despite the successful conversion of large tonnages of previously Inferred gold resources to the Indicated category, the precious metal grades in the latter category have increased in the 2015 estimate relative to the 2014 Estimate. Inferred gold resources in the updated estimate also exhibit increased grade over the two previous estimates. Gold and gold equivalent resources in the M&I category increased by 60%, at higher grades (11.4 g/t AuEq) than the 2014 Estimate (11.0 g/t AuEq=Au+Ag/50), reflecting the Company’s emphasis on infill drilling and sampling in 2014-2015. Measured resources decreased slightly, largely due to current and historical mining depletion. Inferred gold resources grew by approximately 9%, also at higher grades than the 2014 Estimate, reflecting successful step-out drilling. The resulting 51% increase in the number of composites defining the vein domains increased confidence in mineral resource estimations and demonstrate the continuity of the vein domains. Tonnage-grade estimates were also made of 2-metre wide halos on both sides of vein domains, but are not reported as mineral resources. These estimates were utilized to dilute vein domains to 1-metre horizontal width and will be instrumental in defining potential mining dilution in future economic studies. Estimates of tonnage-grade per vertical-metre for the major vein domains (Figures 5 and 6) demonstrate significant mineral resources over an elevation range of more than 1,000 metres and less variation than the 2014 Estimate. Precious metal resource growth over the 2011-2015 period has been achieved at all-up exploration costs of less than $15/resource ounce of gold. This figure includes the high proportion of infill drilling in recent years, largely responsible for the increases in higher confidence resources. 80% of the combined Yaraguá and Veta Sur gold resources are situated above an elevation of 1,000 metres, including 97% of combined M&I mineral resources. Potential remains for future mineral resource increases in the Yaraguá and Veta Sur vein systems, as most of the vein domains modeled in both Yaraguá and Veta Sur are open at depth and to the west. The current mineral resource estimate also excludes a number of vein domains to the south and north for which there was limited drilling as of May 2015. Vic Wall, PhD, special advisor to the Company and a qualified person for the purpose of NI 43-101, has prepared or supervised the preparation of, or approved, as applicable, the technical information contained in this press release. Dr. Wall is a geologist with over 35 years’ experience in the minerals mining, consulting, exploration and research industries. Following a career in Australian and North American academes, he held senior positions in a number of multinational major and junior minerals companies. A Fellow of the Australian Institute of Geoscientists, Dr. Wall is Principal of Vic Wall & Associates, a Brisbane-based consultancy that provides geoscientific services to mineral companies and government agencies worldwide. The technical information in this press release relating to mineral resource estimates is based on technical information prepared under the direction and supervision of Andrew J. Vigar, a consultant geologist (FAusIMM, MAIG, MSEG and Associate Professor, Univ. Of Queensland) holding a B.Sc. (Applied Geology), with over 30 years’ experience including specialist experience in resource evaluation and mining of gold deposits. Mr. Vigar, an independent QP (as defined in the Canadian Institute of Mining, Metallurgy and Petroleum (“CIM”) Standards on Mineral Resources and Reserves and NI 43-101), has reviewed this press release and consented to the inclusion in this press release of extracts from, or a summary of, the technical information prepared under his direction and supervision. Continental Gold Inc. is an advanced-stage exploration and development company with an extensive portfolio of 100%-owned gold projects in Colombia. Spearheaded by a team with over 40 years of exploration and mining experience in Colombia, the Company is focused on advancing its high-grade Buriticá gold project to production. With a goal of being the newest large-scale hard rock gold producer in Colombia, Continental has recently achieved major advances at the Buriticá project and anticipates completing environmental permitting in 2015. This press release contains or refers to forward-looking information under Canadian securities legislation, including statements regarding the estimation of mineral resources, exploration results, potential mineralization, completion of a feasibility study and environmental permitting, and exploration and mine development plans, and is based on current expectations that involve a number of business risks and uncertainties. Forward-looking statements are subject to significant risks and uncertainties, and other factors that could cause actual results to differ materially from expected results. Readers should not place undue reliance on forward-looking statements. Factors that could cause actual results to differ materially from any forward-looking statement include, but are not limited to, failure to convert estimated mineral resources to reserves, capital and operating costs varying significantly from estimates, the preliminary nature of metallurgical test results, delays in obtaining or failures to obtain required governmental, environmental or other project approvals, political risks, uncertainties relating to the availability and costs of financing needed in the future, changes in equity markets, inflation, changes in exchange rates, fluctuations in commodity prices, delays in the development of projects and the other risks involved in the mineral exploration and development industry. These forward-looking statements are made as of the date hereof and the Company assumes no responsibility to update them or revise them to reflect new events or circumstances other than as required by law. Specific reference is made to the most Annual Information Form on file with Canadian provincial securities regulatory authorities for a discussion of some of the factors underlying forward-looking statements. This news release was prepared in accordance with Canadian standards, which differ in some respects from United States standards. In particular, and without limiting the generality of the foregoing, the terms “inferred mineral resources,” “indicated mineral resources,” “measured mineral resources” and “mineral resources” used or referenced in this press release are Canadian mining terms as defined in accordance with NI 43-101 under the guidelines set out in the CIM Standards on Mineral Resources and Mineral Reserves (the “CIM Standards”). The CIM Standards differ significantly from standards in the United States. While the terms “mineral resource,” “measured mineral resources,” “indicated mineral resources,” and “inferred mineral resources” are recognized and required by Canadian regulations, they are not defined terms under standards in the United States. “Inferred mineral resources” have a great amount of uncertainty as to their existence, and great uncertainty as to their economic and legal feasibility. It cannot be assumed that all or any part of an inferred mineral resource will ever be upgraded to a higher category. Under Canadian securities laws, estimates of inferred mineral resources may not form the basis of feasibility or other economic studies. Readers are cautioned not to assume that all or any part of measured or indicated mineral resources will ever be converted into reserves. Readers are also cautioned not to assume that all or any part of an inferred mineral resource exists, or is economically or legally mineable. Disclosure of “contained ounces” in a resource is permitted disclosure under Canadian regulations; however, United States companies are only permitted to report mineralization that does not constitute “reserves” by standards in the United States as in place tonnage and grade without reference to unit measures. Accordingly, information regarding resources contained or referenced in this press release containing descriptions of our mineral deposits may not be comparable to similar information made public by United States companies.